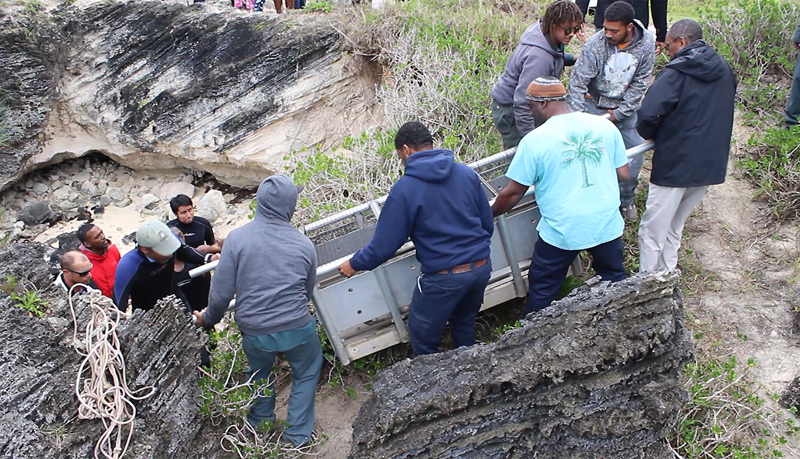 A Bermuda Zoological Society spokesperson said, “This morning the staff of the Bermuda Aquarium, Museum and Zoo [BAMZ] were called to the site of a seal stranding at Tobacco Bay in St. Georges. 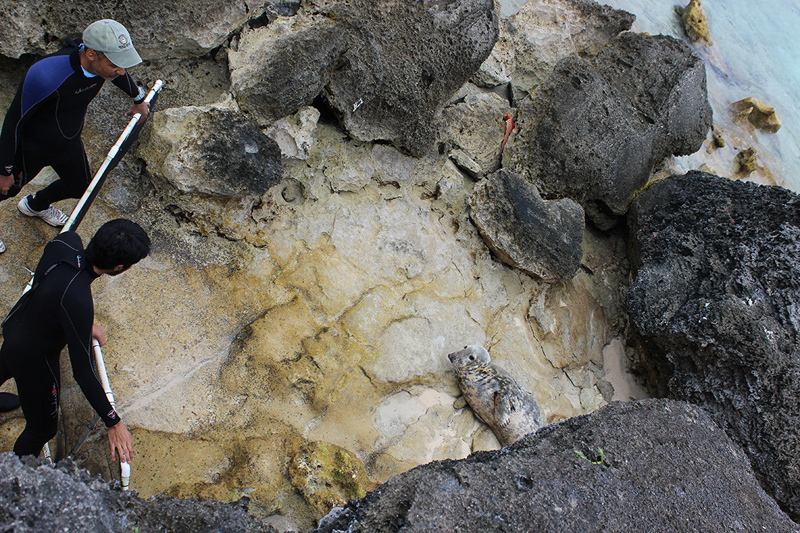 “The seal was initially discovered on the rocks, on the opposite end of the public beach, by a fisherman and staff members of the Government Department of Parks. Upon its discovery, they immediately contacted BAMZ. 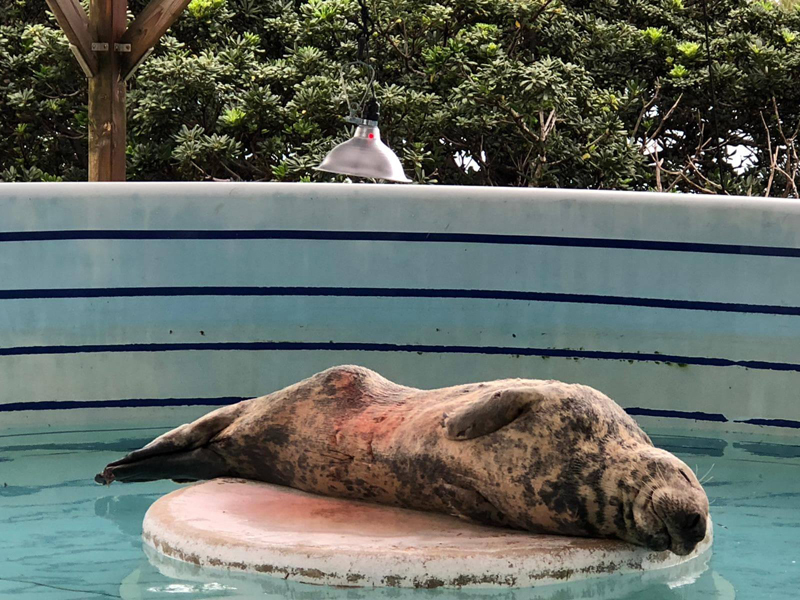 “BAMZ staff members quickly assembled the equipment necessary for a rescue of this nature, and they set out for Tobacco Bay via truck and boat; as they were unsure of the location of the seal, having both water and land access to the animal was necessary. “Upon arriving at the scene, BAMZ staff observed the seal and noted that it was a female grey seal Halichoerus grypus. These animals are typically found on both shores of the North Atlantic Ocean. “These seals are distinguishable from the resident BAMZ harbor seals by their straight head profile, larger size, wide set nostrils and fewer spots on the body. 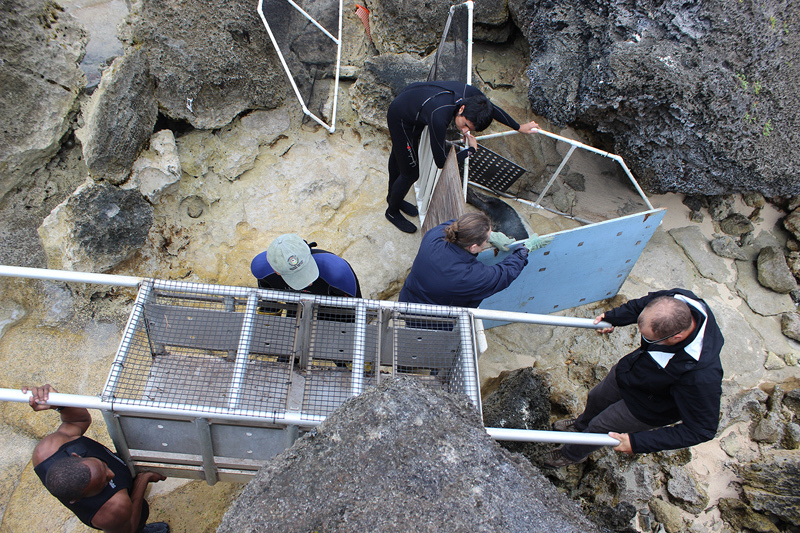 “After assessing the situation, it was determined that rescuing the animal via land was the best option considering its location, which was in a ravine-like tidal pool. “Using methods that are practiced repeatedly with the resident BAMZ seals, the BAMZ staff members were able to carefully corral the seal into their specially designed seal carrier,” the spokesperson added. You can watch the live stream replay of the seal being removed here. 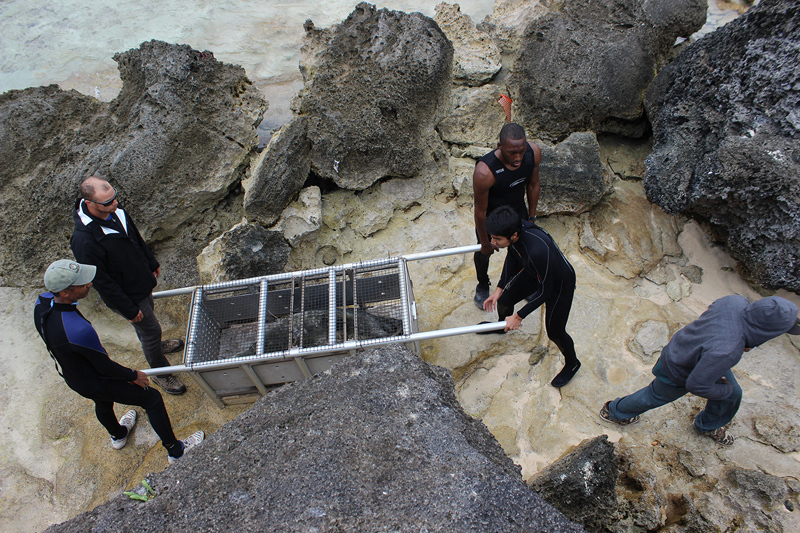 “After the seal was secured, a few members of the public were enlisted to aid in lifting the carrier out of the ravine. Although other BAMZ staff were present, due to the potential for cross contamination of the resident BAMZ animals, they were unable to assist. 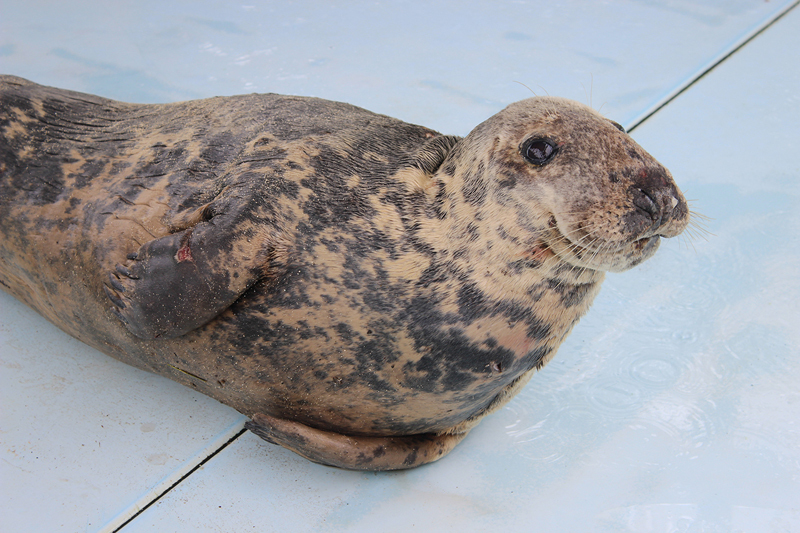 “The seal was transported to BAMZ and is currently being observed and cared for in quarantine. Bermuda we have to name her! She does look like she’s smiling! So lovely to see! I come all this way to chill out in the sun in Bermuda and you guys cart me off like this? I just wanted to relax! Well at least I still have my cell phone so I can post pics on Facebook. Wait until they send her back to the US. She’s gonna be pissed! Poor sight. In quarantine is it? Waiting on immigration papers? Awesome work by all involved. This kind of made my day. Seal looks quite content under that heat lamp. Well done to all those involved. That smile at the end. Looks very content with herself. I’m so thankful she made it safely to our shores. I know the BAMZ will do all it can to nurse her back to health. I look forward to hearing of her transport and release back to the wild in the USA. She deserves this! Scary thought! A hammerhead swimming around causes some discomfort, but a great white would mean panic! This is wonderful. Saving and animal. 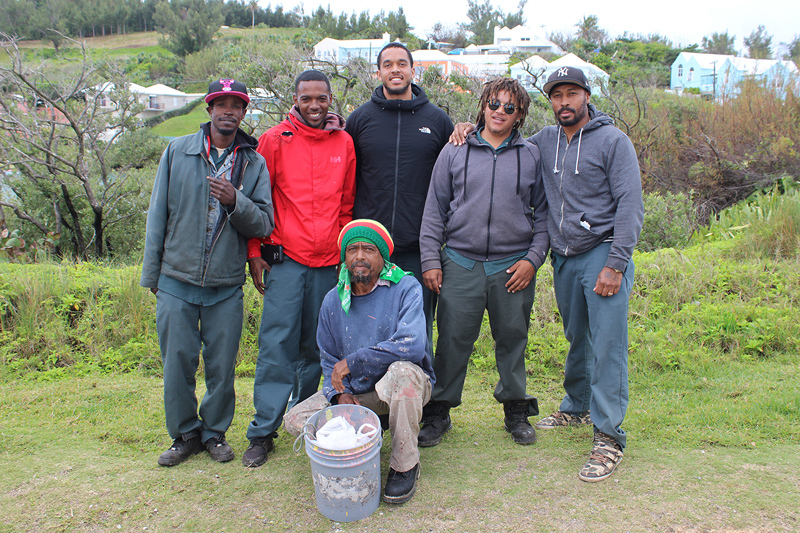 The folks at the Bermuda Aquarium do great work in Bermuda. Has anyone come up with a name ? i wonder what his story is? What a great story! Congratulations to all of the kind people who helped in her rescue. She was probably chased by a great white and was so scared she didn’t stop till she found Bermuda. I hope you can release her in NH where we have a great grey seal population, but few great whites, unlike Cape Cod. Her sunny smile says it all! Well done guys. Saving an animal is always good.